This image paints two very different views of ancient Mars: one warm and wet (top left), and the other a frozen, icy world. Ancient Mars might have looked more like an icy snowball than the warmer, wetter planet that many researchers have suggested, according to a new study.The study suggests that channels seen on the Red Planet's surface are better explained by erosion from ice and snow runoff — and not by flowing water — in the ancient past. But if ancient Mars was, indeed, an icy wasteland, that would have made it harder for potential life to take hold 3 billion or 4 billion years ago, researchers behind the study say. Wordsworth and his collaborators arrived at this conclusion after running 3D atmospheric models to see how water moved between Mars' surface and its atmosphere billions of years ago. 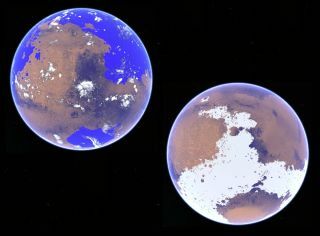 The first scenario envisioned Mars as a temperate place, with an average global temperature of 50 degrees Fahrenheit (10 degrees Celsius). The second scenario then cast the Red Planet into ice-ball conditions, with an average global temperature of minus 54 F (minus 48 C). The results showed that the "cold" model did a better job of eroding features on the planet's surface similar to those observed by spacecraft currently on and orbiting Mars. Further, the researchers said the "cold model" was based on a more accurate representation of the sun's history (it was 25 percent dimmer at the time) and the way Mars' axis was tilted 3 billion to 4 billion years ago.In that scenario, Mars' poles would have been pointed at the sun, which would have caused a buildup of ice along the planet's equator. There also would have been a thicker atmosphere that would have exaggerated the effect: The equator highlands would have been cold, and the lower lands at the poles would have been warm.So, is it possible that Mars was warm and wet? The scientists said that scenario is more unlikely, as previous work shows that carbon dioxide, dust and clouds are still not quite enough to make the planet that way. By contrast, the model showed some of the places with the most erosion features (such as Margaritifer Sinus) were almost dry. This is because, just as on Earth, mountains created rain shadows in certain regions on Mars. Specifically, the Red Planet's Tharsis region would have created rainfall on the western (windward) side, while Margaritifer Sinus was on the eastern and drier side. A paper based on the work has been accepted for publication in the American Geophysical Union's Journal of Geophysical Research: Planets.